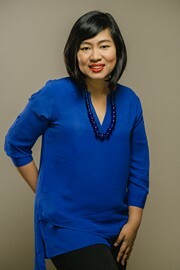 Rachma holds a master's degree in non-farm activities and rural development from the University of Rome in Italy, and an undergraduate degree in economics from the University of Indonesia. Prior to joining SMERU, Rachma worked as a junior research analyst for Bappenas (Indonesia's National Development Planning Agency), and as a teaching assistant in the statistics laboratory at the University of Indonesia. Rachma won the National Economic Students’ Scientific Writing Competition in 2004, held by the Journal of Economics and Development.